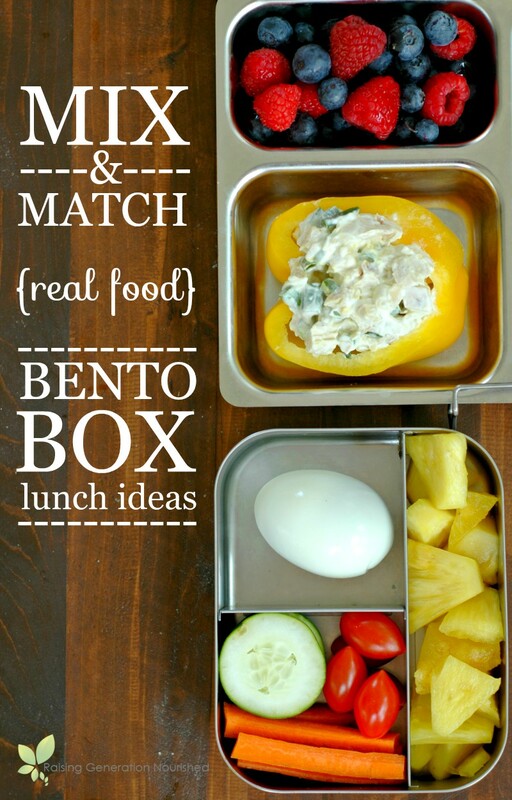 Mix & Match Real Food Packable Bento Box Lunch Ideas :: PLUS! 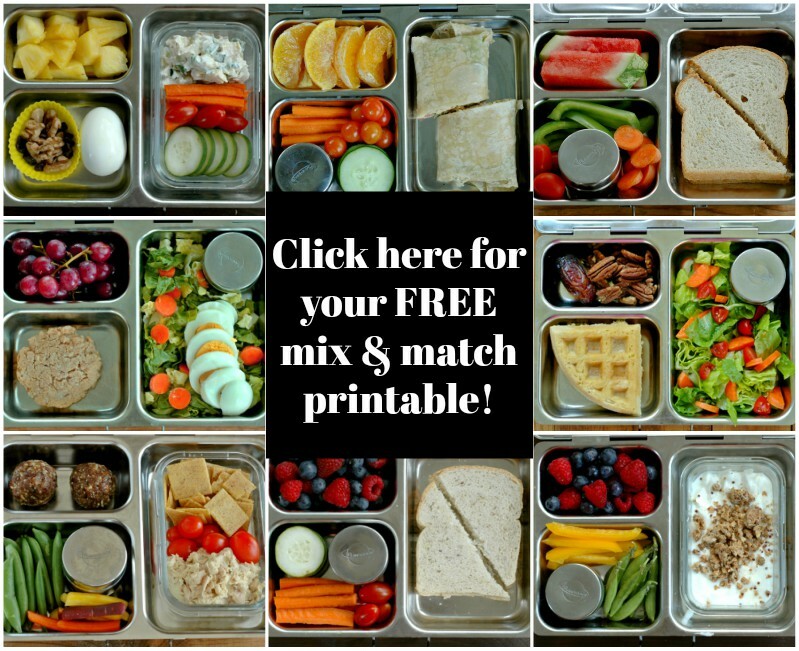 A free mix & match printable for you! 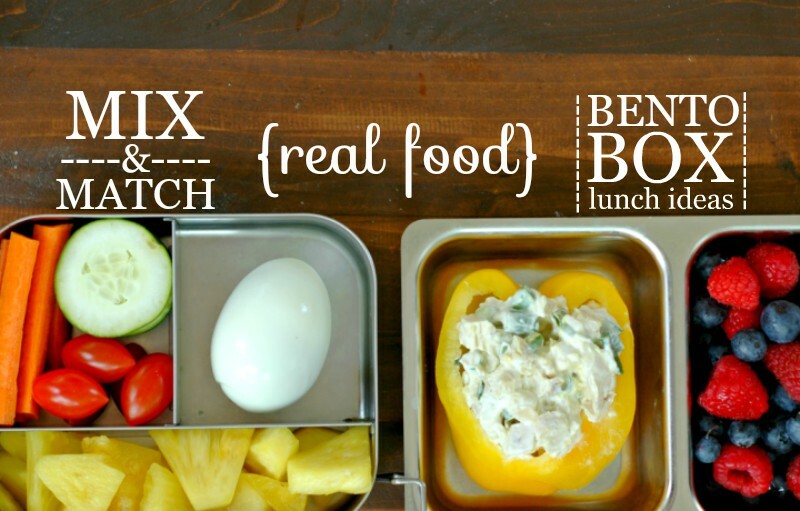 A simple “mix and match” lunch plan to help you and the kids pack fun and healthy, real food lunches! I originally planned on this post for the middle of August to get everyone’s wheels turning toward back to school, but get this…. And I don’t know about you, but I spend almost as much time packing up lunches in the summer as I do during the school year for everything from park picnics and beach days, to zoo trips and friend visits. So one of my goals for this post is for it to be universal. 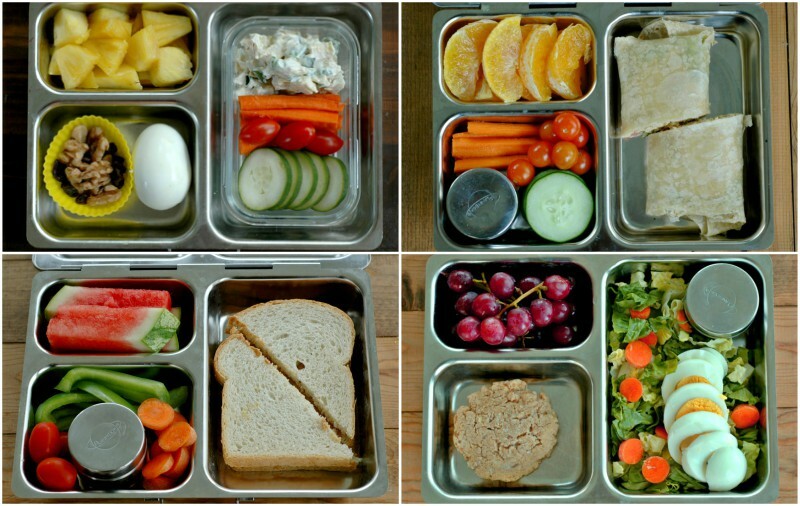 An all year plan for lunch packing that is evergreen from the first day of school through the last day of summer – without getting boring. And as always, my number 1 goal in lunch packing is to make every bite count. Nutrient dense and nourishing to fill up busy, on the grow bodies and brains. So let’s make this fun! Sit down with the kids and let them do some mixing and matching for their lunch! I’ve left an outline here so you can have some links to recipe ideas, and here is a printable PDF for you to print out and use together as a family. You can laminate it and use dry erase markers for the kids to mark off what they like, or you can mark off the choices they have to pick from for the week based on what is in season right now and what you have grocery shopped for. Tuna salad (or could use canned salmon) – can serve this as a sandwich, wrap, pita, in a bell pepper cup, or as a dip with crackers or veggie sticks. Egg salad – can serve this as a sandwich, wrap, pita, in a bell pepper cup, or as a dip with crackers or veggie sticks. Chicken salad – can serve this as a sandwich, wrap, in a bell pepper cup, or as a dip with crackers or veggie sticks. Hummus and veggies wrapped in a pita, wrap, or with crackers. Granola chunks or easy trail mix with raw cheese or coconut flakes or coconut butter. For trail mix I just take a handful of whatever nuts/seeds I have on hand and mix it up with raisins or other dried fruit. You can add a TB of Enjoy Life chocolate chips if you have older kids that are used to “typical” trailmixes. Pick as many as you like to fill the veggie section of your lunch container! Other veggie sides to try! Salads with quick homemade dressings (try some of these!) Can add hard boiled egg or nuts/seeds to the salad too! 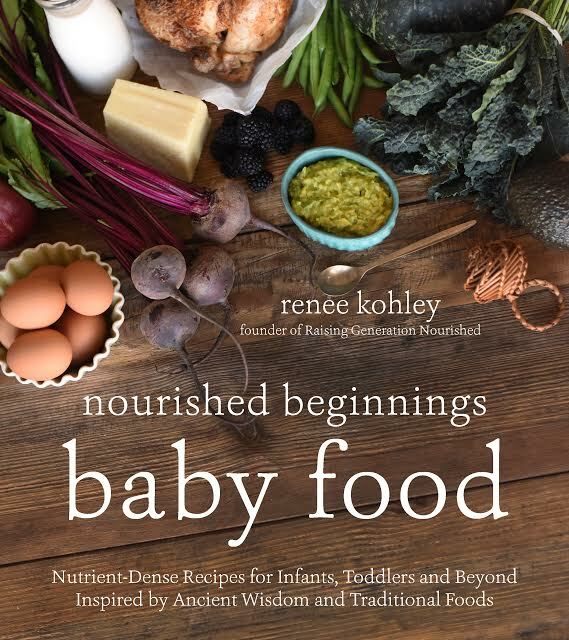 Ferments such as pickles, sauerkraut, dilly beans, or fermented carrots. Either homemade or check out Bubbies brand at your health food store if you are just getting started! 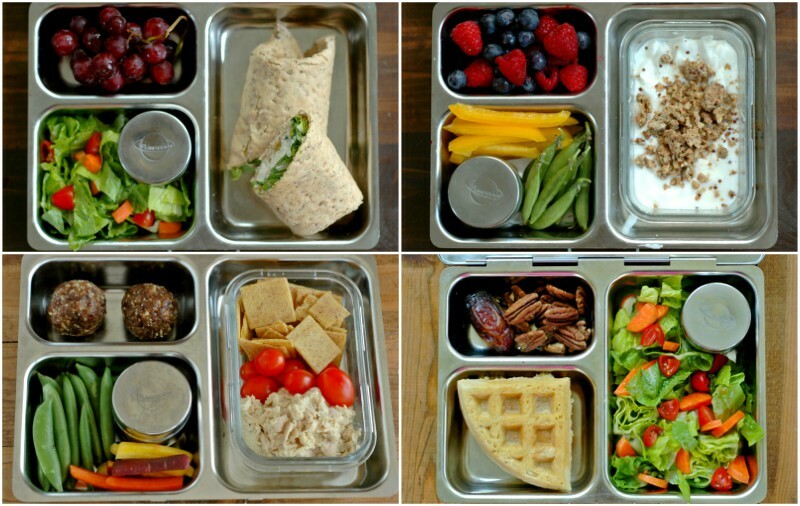 A few of my favorite Bento Box style lunch gear! 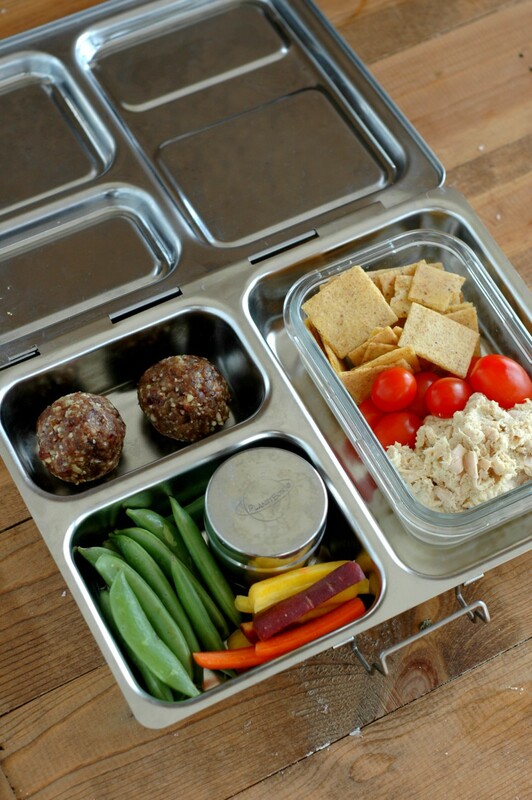 Our school lunch staple has been the PlanetBox. We are going on our 3rd year of this box and it still looks brand new. Occasionally I will get inquiries about what I think of the cost, and, in my book, buying one lunchbox that lasts for years on end when being used day after day, is a huge budget saver! We use the “Launch” style, though they have a few different layouts depending on how you like to pack up! I really love our LunchBots containers as well. The Uno , Duo , & Trio are a great sizes for toddlers and little kids, and we are going on our 3rd year of them holding up just like brand new. During the fall and winter months of school, my daughter takes along soup or dinner leftovers 2-3 times per week requiring the use of a thermos. On those days a thermos of soup and a LunchBots container of the extras makes for perfect packing. The also have larger sizes for the bigger kids and teens too! A quick note on packable drinks! Water is our staple, though we do drink a lot of kid friendly nettle infusions as well all year long. Herbal tea infusions can be a great way for kids to hydrate and load up on missing minerals from a busy morning. Adding a squeeze of lemon is always a nice idea if your kids like that! We have used these Kid Basix Safe Sporter cups for the last 5 years – including the last 2 years of daily school. 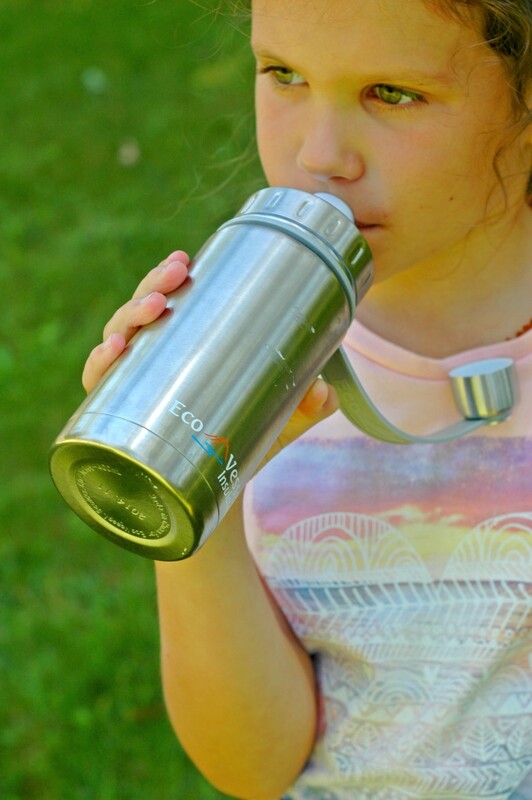 The spouts are finally starting to look a little worn after 5 years of daily use so I think they have been a good buy especially for toddlers and little kids in early elementary who maybe won’t handle an open water cup as well for on the go situations. This year I decided to invest in an “older kid” water bottle and we went with these Eco Vessessl for Kids for both my 2nd grader and I think my new Kindergartener will do fine with these without spilling. My toddler (2 years old) drinks out of open cups perfectly, but doesn’t manage a bigger, open bottle like this without help. Ok! Keep me posted on those lunches! You can follow my Instagram hashtag #rgnschoollunches for more packable lunch ideas too! Oh! And don’t forget your free mix and match printable! 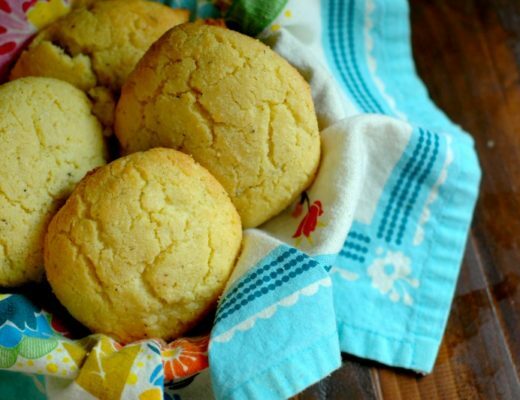 Grain Free Herb Butter Biscuit :: 5 Minute Blender Prep! 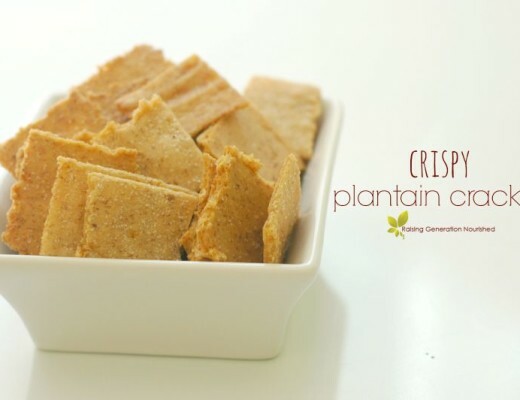 Crispy Plantain Crackers :: Great for toddlers, kids, and adults! Gluten, Egg, Nut, & Dairy Free! Renee this is great! So helpful, especially for summertime day trips and picnics. These look marvelous and inspiring. 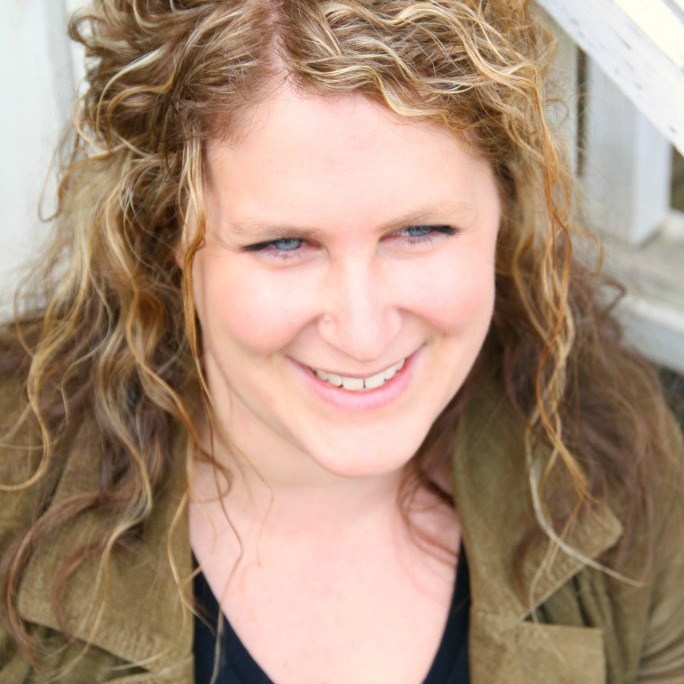 Thank you for all the work you did equipping other moms (or dads)! Love the visual inspiration and my 12-year old loves the printable! Hi Michelle! That’s great! Happy school year to you guys!